Are the two buckles on the flap real buckles or do they have magnets or clasps underneath? 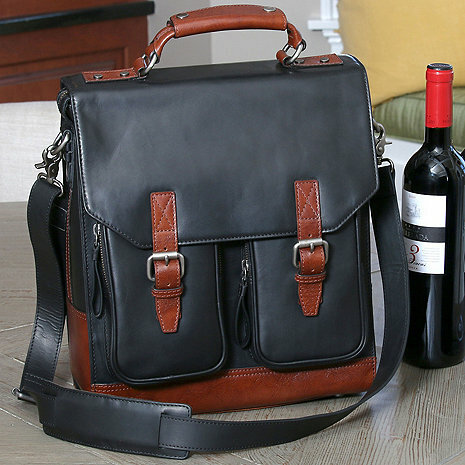 BEST ANSWER: The 3 Bottle Leather BYO Wine Bag (Charcoal) buckles are real. They actually keep the flap affixed to the bag. There are two pockets that the buckles sit on which have you can use for wine openers, etc. They open and close with a zipper. They are real buckles. Wish they had magnetic clasps but you are assured it won’t open accidentally . It’s really an awesome piece! They are real buckles. Magnets would be easier but less secure. It is a very nice carrying case. They are real functional buckles. Bought as a gift for fellow wine lovers. The quality appears to be excellent. I'm sure they will love it. The bag is elegant, great colors and can accommodate different size bottles. Extra pouch for cork opener. I am very pleased. It was a gift and cannot give you my opinion but I liked it very much. High quality bag. The color is great and so is the size of the bag. My husband loved his wine bag. It is great quality...and the leather smells so good. It was the perfect present! Love our new wine bag; it is sturdy and good looking! First time I used it the initialed tag fell off and was lost. I had to put cardboard between the bottles to protect as no divisions. Easy to tote! Nice quality leather and sturdy. Love the quality of the wine carriers but thought they had a divider between bottles so they would not touch each other. I wish it had dividers to separate each bottle. My husband loves the appearance. We used it for the first time at dinner this weekend and he found that the way it sits, makes it flip forward. Also, the buckles on front are a little tedious. Our hope is that once it gets broken in, both concerns will get better. Love the way its's designed so you can put your cell phone and other items in the front pouches. Wish there is more room for 2 wine glasses. Other wise it’s fantastic. Love it. My husband loves this bag .Beautifully made, looks great & very functional. I get so many states when traveling with this bag. Gorgeous leather that stands still when sat upon a table. The inside is just enough for three bottles, however, I use it as a regular carrier fir whatever fits in it. It is breathtaking, well made, and durable, which is what I was looking for. I highly recommend it. Oh, don’t limit it’s potential. Carry it everywhere!